Heartland Center is very excited to announce that we have hired Catherine Norwood as Marketing and Recruiting Director. Catherine will be well known to many who are associated with Heartland. She grew up in the First Presbyterian Church of Lawrence, Kansas and attended summer camp here for 10 years. 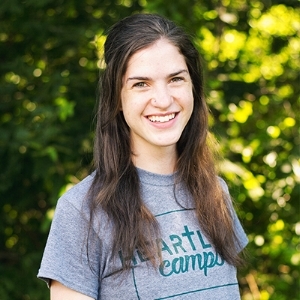 In 2013, she became a summer staffer, serving as Camp Photographer. In 2015, she took on the duties of Media Team Leader. Catherine graduated this spring from the Columbus College of Art and Design, Columbus, Ohio with a BFA in advertising and graphic design. Her experience and education will be valuable assets in working with our hospitality, program and fund raising divisions. She will assist with and help to expand our various social media and outreach activities as well as marketing and branding projects. She is excited about the opportunity to use her gifts and talents in a place she really loves, with a mission and ministry that she supports. Catherine sees the job as a particular call from God and has confidence that this is the place she is supposed to be. If you have the occasion, please welcome Catherine in her new role. We look forward to the many ways she will be able to support our mission here at Heartland. Now that the summer camping season is behind us,we are involved in several major projects that will impact the camp. A new water line is being installed to add capacity. It will support any new building projects and also provide additional fire protection to current structures.This project is made possible by a bequest from the Davis "Dave" Ege Estate. Dave was a long time supporter of the camp. Because he was an engineer, Dave's family said a waterline is just the sort of thing he would want to support. The roofs of all major buildings are being replaced.This project has been undertaken to address hail damage. Fortunately, our insurance coverage will underwrite the costs. The lower level of Genesis Hall is undergoing a renovation. This remodel will create an updated meeting space for the Hall. Much of the work is being carried out by our own facilities team, making it very cost effective. Funding for the renovation was raised at a birthday celebration for Doug Hundley last summer. We deeply appreciate Doug using his birthday event as a benefit for this ministry that he and his family love so dearly. Constant vigilance and attention is required to maintain our facilities and grounds for campers and retreat groups. We are excited that these projects will contribute to our ongoing ministry and mission. TRAVELING DAY CAMP- 2018 BIGGER THAN EVER! Believe it or not, we have already filled all 40 church slots for Traveling Day Camps for next season, the summer of 2018. This program has proved to be very popular and a great way for youth to participate in a robust camping program in their own particular locations. Our Traveling Day Camp continues to grow; we increased our capacity for next year from 30 to 40 churches and will be able to serve over 2,100 kids. VISITORS ARE SAYING . . . Thank you so much for all of your help and patience with us as we planned our retreat, and for the warm hospitality! We had a wonderful time. The meals were delicious, the rooms and facility were clean and comfortable. Thank you! God bless you in your ongoing ministry. This was a beautiful experience. Please keep in prayer those who will be on campus in October.